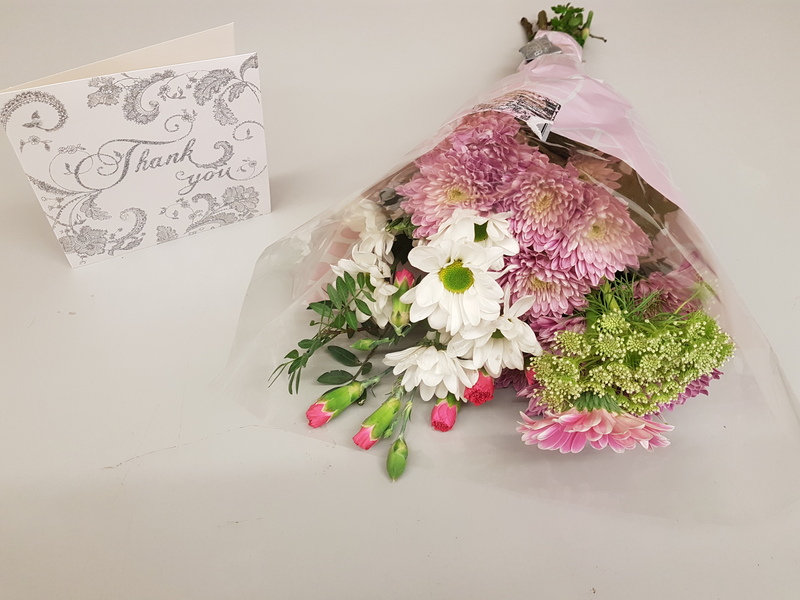 Thank you for the flowers Mr P.B.! I am truly sorry that matters took from my side so long. I am truly grateful to you for your kind patience and for the quick dispatch & for your splendidly managed business. The package has been received perfectly and thank you for your great service. Very satisfy with the items. I am very happy with the service I received from London Coins. watch and he was quite pushy with a valuation that seemed awfully low for a collection of gold coins. 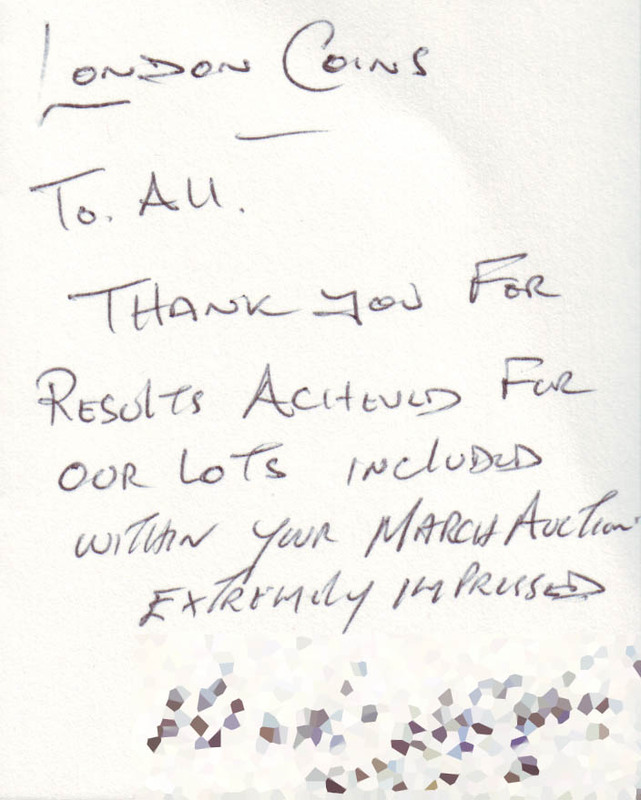 previuosly mentioned roadshow firm and advised that I was better off putting them in their auction. I'm glad I did, because the estimate proved to be accurate to within £50 and I am extremly happy with the result. the coin has been successfully delivered. From beginning to end I cannot recommend this company highly enough. You are both professional & firendly. After researching other dealers & auction houses it quickly became evident that LCA had the most knowledge of international coins & international markets, with the most accurate estimates. I will not hesitate to use this company again. It has been my pleasure doing business with you. I had no experience of selling anything at auction, but after receiving the gift of many Royal Mint coin sets I came to the decision it was probably the best way for me to sell them. I was happy to have the coins collected from my address in Yorkshire but apprehensive about handing them over as I had no experience of London Coins. However I am now delighted to have received funds and feel that the company acted in a most professional way and I'm happy to have used their expertise in this market. What a lovely sight the email is. We are delighted with the outcome of the auction. I received my item today - it was packed with great care and I appreciate that very much. Knowing nothing about coins, I'm so relieved to find a coin dealer I could trust. I've just seen my late father's collection sell at auction for far higher than I expected. Thanks! I am a buyer on the London Coins auction site and the ease of placing bids, accurate descriptions, the speed of delivery and tracking info could not be more superb. 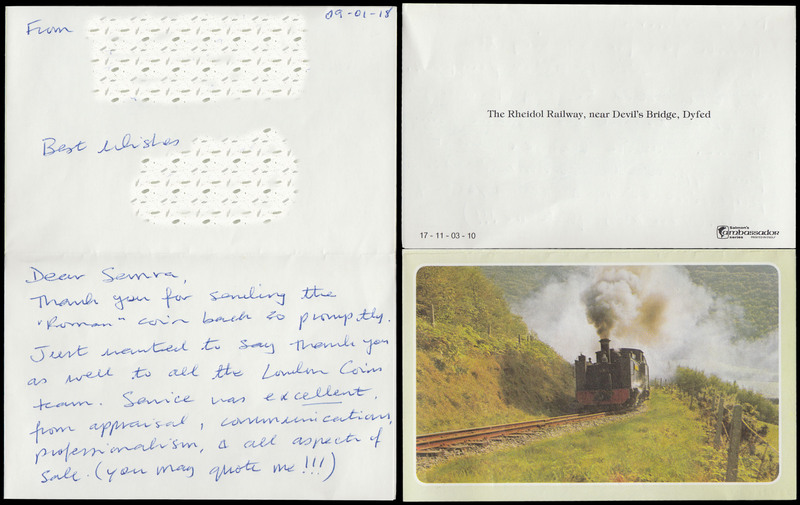 I found London Coins listed on Numisbids and I got a wonderful service from the LC staff. I'm very happy with the lots I won at the sale. Beautifully done presentation online - most impressed. Just a quick note to say the 1937 Irish shilling arrived safely yesterday. Very pleased with the coin and your communications. Looking forward to seeing the next catalogue. The parcel has arrived yesterday. Thank you for your appreciated care and efficiency in this matter. I received the splendid coin. Received. Very satisfied. Thank you so much. Merry Christmas. Thank you so much for another first class transaction. I received my purchase from your recent auction, thank you for posting. I am very pleased with the quality of the item and shall certainly be looking at your future auctions, if possible in person to purchase coins. Thank you for your assistance, this was my first time purchase of coins through auction. 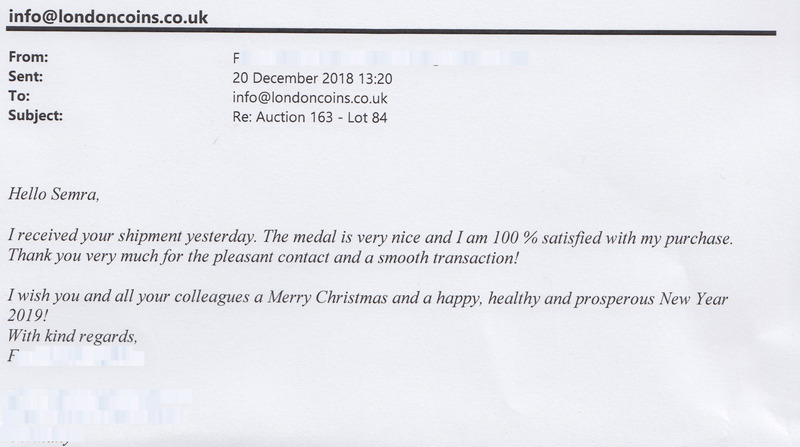 I just wanted to say a huge thanks to you & the rest of the London Coins team for a fantastic December auction result. The speed of delivery (and tracking info). I look forward to December's Auction. Coins arrived safe, I am happy with them, Thanks. The funds arrived in my account today. Thank you for keeping me informed about the progress. Thank you again for the trust and for being an incredible professional! Thank you for sending through the results of the coin auction. 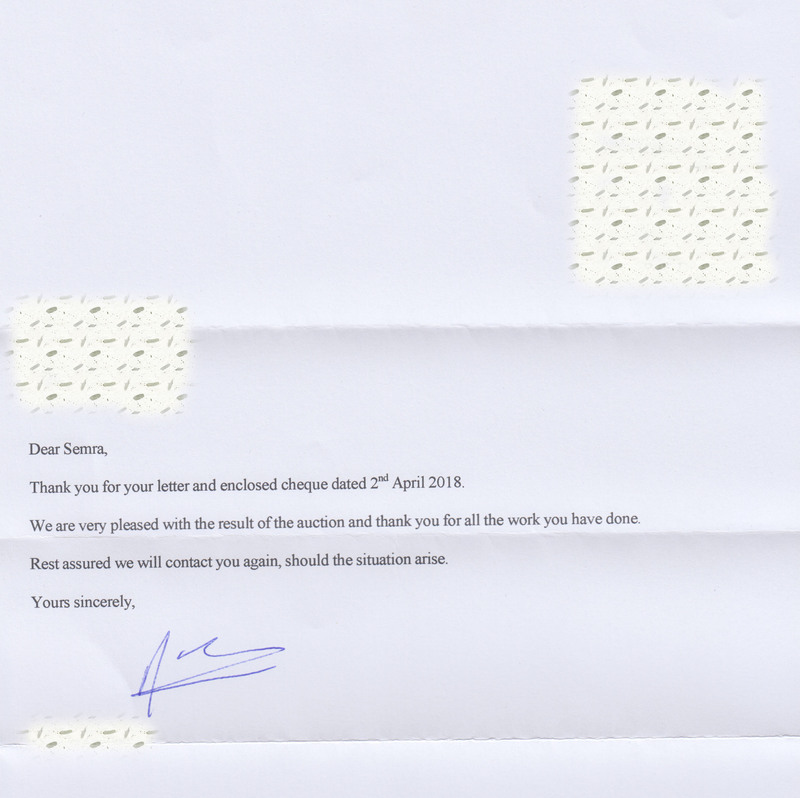 We're pleased with the price they went for and with the service we've received, so thank you. Many thanks for the prompt dispatch of the cheque for my sold medal. I am very pleased both with the price achieved and the efficiency of the payment process. Semra, many thanks to you and Stephen, and the rest of the LondonCoins team, for selling the coins I had. (I would have liked to attend the auction but I was away then). Also for letting me know the results, which I am very pleased with. Many thanks to LondonCoins! Regards Chris H.
Well done for selling both coins at good prices. I'm happy to advise that the coin and the cheque have both arrived safely. Thank you for your letter of the 11th Dec 2013 and the enclosed cheque in full settlement. 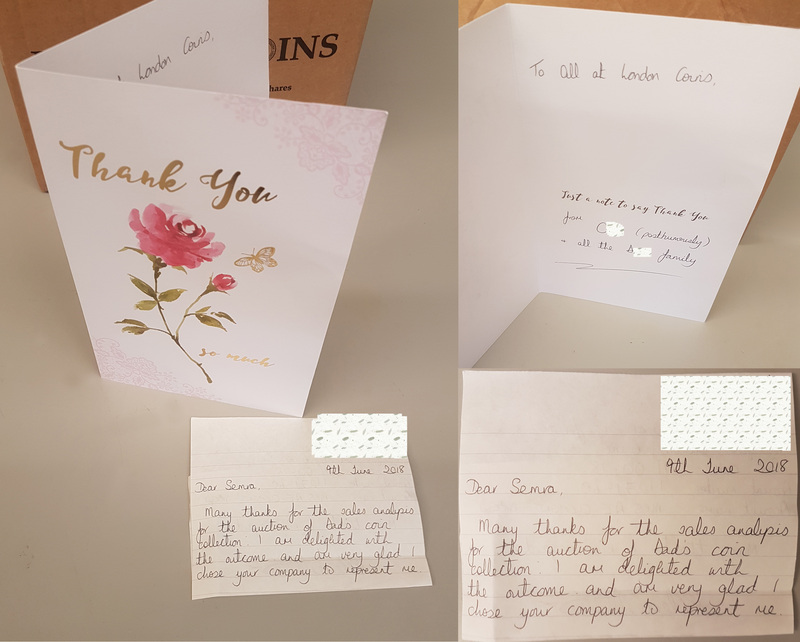 I would like to take this opportunity to say what excellent and efficient service and communications you have offered in the sale of my coins, from the appraisal to receiving the final cheque. Wishing you all at London Coins a Happy Christmas when it comes. 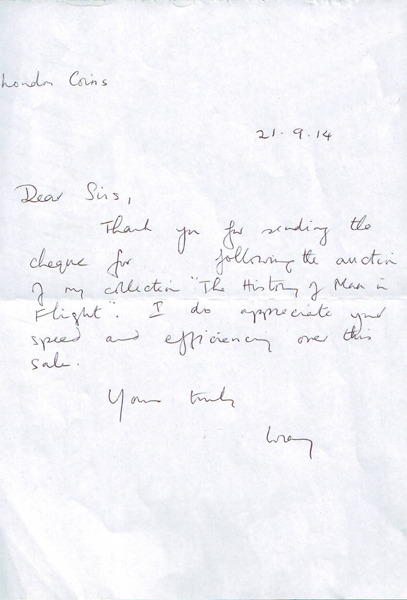 Thank you so much for your letter describing my auction sale. I really appreciate your efforts there. Thanks for everything. The results are excellent. I am very pleased. I will have to try and get together some more stuff now for December!!! Just to say thank you for your eagle eyed suggestions. The 1893 Pr Cr is really beautiful - as are the others. Most efficiently despatched by Semra as always. You have gotten together what looks like a wonderful sale. Your photos and website are also excellent. Well done indeed! Looking forward to your help, with thanks. 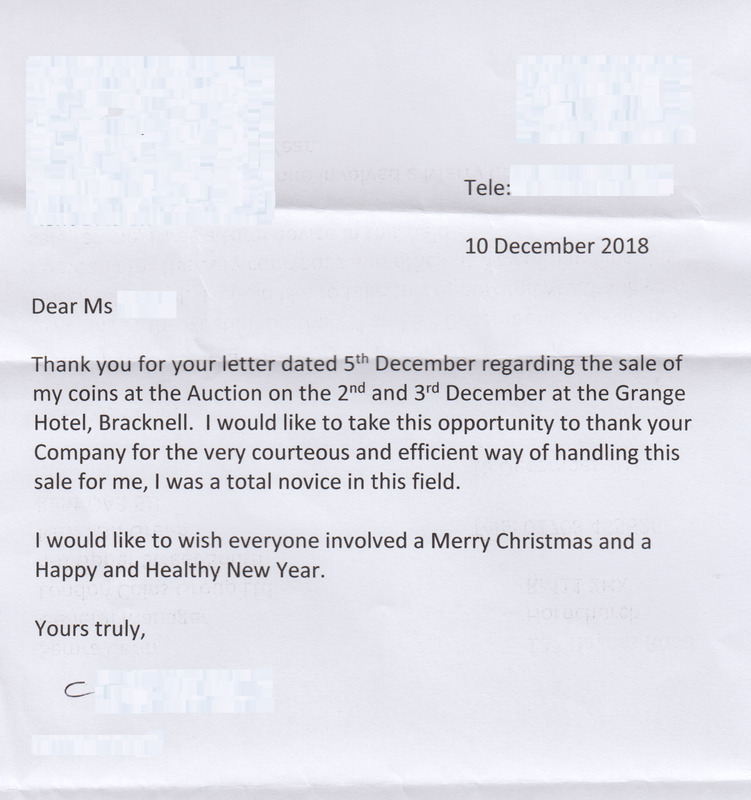 This is just a short note to say thank you for the three lovely notes and, more particularly, for the very high standard of grading that you applied. As a relative newcomer to note collecting, I am discovering by experience those with whom I can confidently deal. As with other collectors, my willingness to bid on-line is crucially dependent upon confidence in the integrity of an auctioneer�s appraisals. In this respect, the quality of the notes that I bought from yourselves speaks volumes in favour of London Coins, while the very high standard of the items offered in your March auction suggests that other much more experienced collectors share my positive opinion. Today, my secretary told me that the coin arrived (I am on a business trip). Just a quick note to let you know my coin arrived safely yesterday. I thank-you for all your help and look forward to future auctions! Yes I am very pleased, the coins I consigned were all ones I have had for a while and were beginning to stick so to sell them is really good, also was impressed with how efficiently you handled everything down to my bids. So thank you and I will now regularly consign to each auction. I highly appreciate your efforts and the quality of service you provide. The payment has been received at my end. I have recieved my two items and they are in perfect packing. Thank you for your professional way of dealing. Just writing to confirm receiving your payment, and to thank you, Stephen, and all others involved, for a successful sale. I hope to have a few more items for a future auction. Pouch well received this morning. The package was perfect and coin is very beautiful. I have just received my coin, brilliant job! Just a quick message to say thank you for your service! Yes the figures are in line with what we discussed. we enjoyed the experience and the weekend. Today I have received the parcel, thanks for your good packing, I am so satisfied. I have received the sales analysis and just wanted to email to say how happy I am. You have made the whole process so easy and I think we have achieved a fantastic result. It has definitely made the wedding plans a bit easier (only a week to go now). 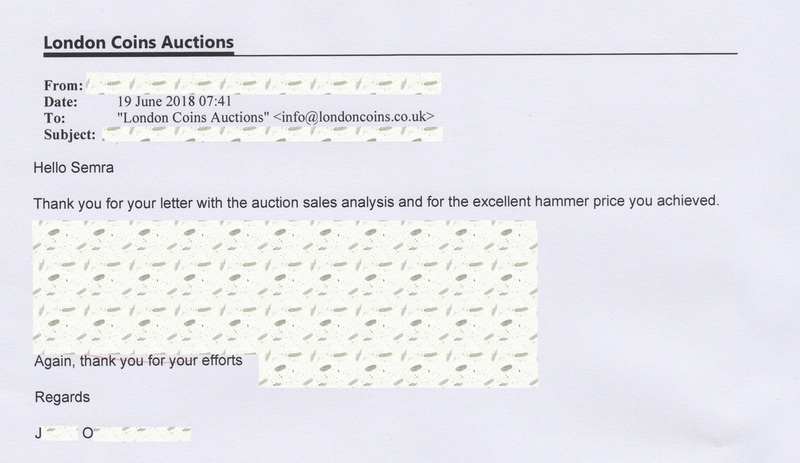 I would like to thank your firm for the professional manner in which you handled the sale of my coins and for achieving a good price at auction. I would certainly recommend you to anyone interested in selling their coins. Magnificent service as ever. I'll be sending some more coins to you for the June auction. Love the catalogue. Thanks for everything! Have received your cheque in full settlement of the sale in December. Many thanks for your fast and efficient service and hope that you may be able to assist in the sale of some foreign gold coins in my possession. Great results Semra. 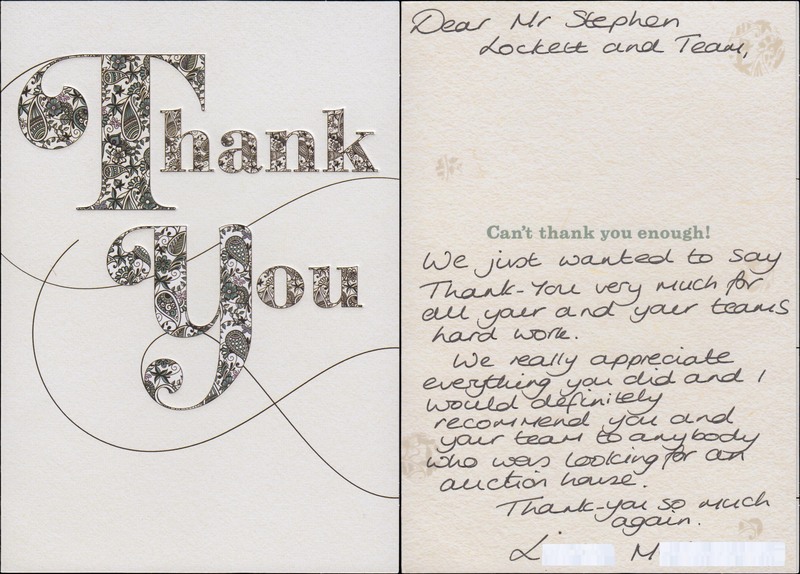 Many thanks to you, Stephen and your team for such first class professional guidance and advice. I would certainly encourage anybody finding themselves in situation similar to mine to contact London Coins in the first instance. Many thanks for cheque received today. I was very pleased at the amount that was realised. I would like to thank you very much indeed for the two sales you have conducted for me. Your service is excellent. A very happy Christmas to you all and a healthy 2011. Great sale, you guys must have worked day and night, well done. See you at the sale and hopefully my lots will do well. 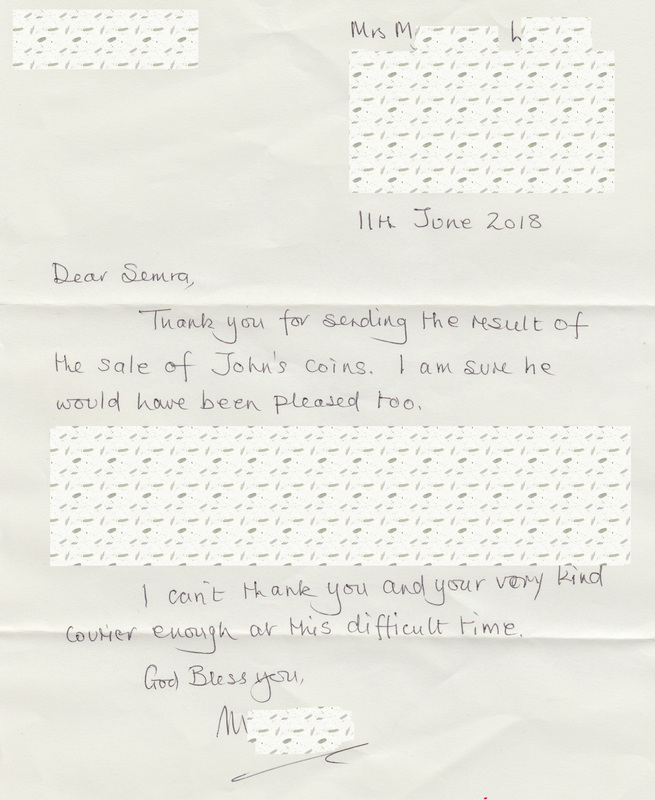 I am just writing to confirm I am now in safe receipt of my "British Banknotes Coin Collection" which you returned to me by recorded delivery, I received it at the end of last week and everything is okay and thank you for your time, consideration and advice. Thank you very much for dealing so efficiently in the selling our our coins. We much appreciate the total sum raised. I would definately recommend your company to anyone else who wished to sell a collection. Just to let you know the coin arrived safely today � very pleased with it � and great service as usual. Thank you for the cheque safely received. 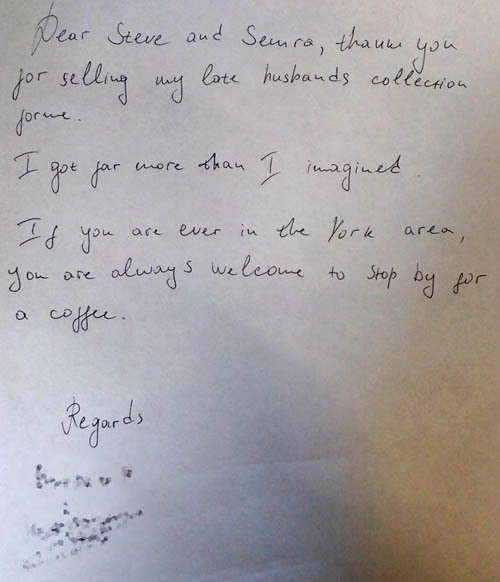 Just a note to thank you for the excellent service you have provided me in the sale of my coins. Very speedy payments and realistic estimates! Many thanks. Hope to do business with your company directly in future if you can supply coins which we need. A quick note, to say the cheque has arrived from the auction sales safely. 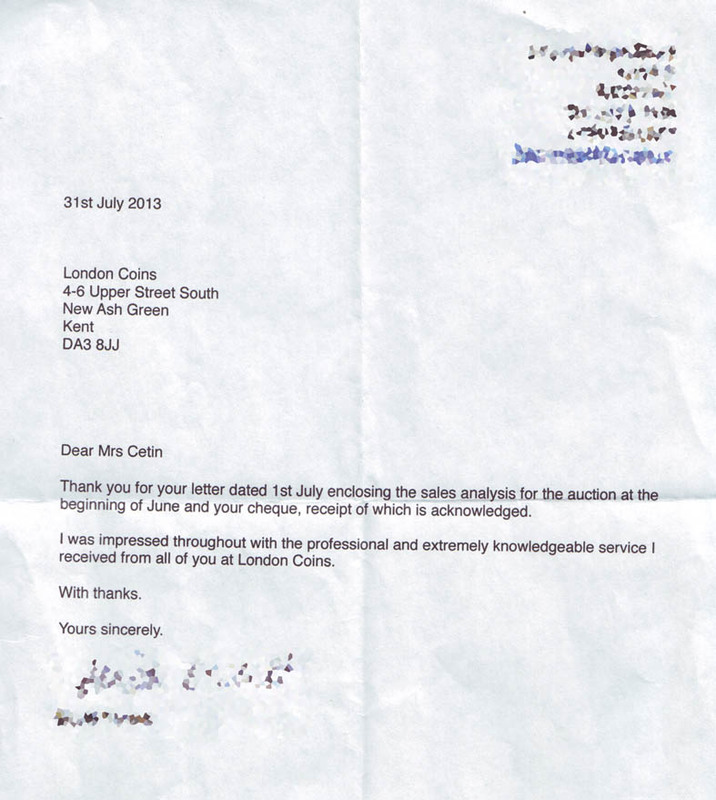 Thanks again to all at London Coins as you made the whole process very easy and hassle free. I hope the rest of the auction was very successful. Everything happened exactly as you said it would, all my lots sold. Thanks for doing everything you promised and more. Great, fast service. Thanks!!! Will definitely use you again. Today I received the note in good order. Thank you. Extraordinarily fast! Confirming that the two items have been received today in excellent condition. Thanks very much indeed. I look forward to your next auction keenly. Hi Semra, Items arrived today. Very pleased with them and your great service. Thanks. Nearly all my lots went well!! Great stuff. I was very pleased with the sale. When is the next auction? I will have to start accumulating some new coins for that! Many thanks for the prompt and safe delivery of my purchases. Wow the photo is superb, thank you so much! Am sending in some coins to be evaluated at the standard rate and look forward to speaking to you on Monday about buying some more! Thank you for letting me know so quickly. Most efficient. Cheque posted today. Hammer total £10,685 with 90 out of 134 lots selling which is 67%. Which is of course better than most auctions are achieving. Many thanks - coins received - highly satisfied. First let me thank you for such an excellent first experience of a London Coins Auction. I thought the event was superbly managed with some lovely items offered for sale. I must also thank you for the opportunity to acquire some significant pieces for my collection of Victorian Shillings although at the time I didn't realise quite how significant. Thank you Semra, I appreciate your prompt response. The coin has now arrived, very nice. Thank-you. I think your grading is good (not the case everywhere!) and the pictures on the website also, which is very important when you can't be there. I received the coins today and they are fantastic. If your firm happens to SELL South Africa high grade coins out of inventory and you ever happen to have them, please feel free to drop me a note. You'll cope 'cos you're a super hero!!!! Thank you for your professional setup. I am delighted with your Catalogue, the speed you get results on your web site and the most pleasant lady I spoke with on two occassions. I look forward to doing more business with you in the future. Great & thanks - as efficient as ever!!! thanks for that - both packages arrived safely today - everything as expected. Once again many thanks for all the help and first class professional service. Thank you for the invoice I will forward payment. I was watching you on Saturday and I was really impressed how you ran everything. I think you managed to control everything from the viewing to the phone bidding. The coins arrived earlier today with grades even higher than I had expected! Big thanks! I've received the four coins that I won, and I'm VERY pleased with them, especially lot 576, an ex-Nicholson Collection piece. My complements to London Coins for putting together a sale that featured really super halfpenny material!